The final pie in the Thanksgiving series is mincemeat pie – the pie which is equally appropriate for the Christmas season, which approaches with great haste. Mincemeat pies were around for a long time before they were called mincemeat pies. Meat with fruit in pies goes back to medieval times, and there were many names for the end result (see the 15th C recipe for Chewetys). It seems that the specific name ‘mincemeat’ referring to a mixture of minced meat, sugar, fruit, and spices is a late eighteenth or early nineteenth century phenomenon – but don’t quote me on that as I can hardly claim to have investigated it exhaustively! The OED gives the first known use in print as in 1824 in The Virginia Housewife, but I seem to remember seeing earlier uses - let me know if you know any, please! Mixing meat (or in later times just suet) with sugar and dried fruit was a convenient way of pre-preparing rich pie fillings as the mixture would keep a very long time – an important attribute before canning and refrigeration. The dried fruit, sugar and spices were expensive imported items, and meat (and fat) was always prized, so the mix of “the goodly litter of the cupboard" was standard fare at any special occasion. We have long since lost the meat from mincemeat, but what remains still has a faint echo, if you listen carefully, of its medieval heritage. The Vintage Christmas Recipes Archive contains a number of mince pie recipes dating from 1588, and includes mincemeat without meat, without intoxicants, with eggs, and with beets. In the link above is a recipe for Queensland Mince Meat (with mango), and elsewhere there is Mock Mince Pie and Eliza Acton's Mincemeat Pudding. There is always room for one more idea however, and the following is from ‘a married woman’ in 1847. Parboil a beef's heart, or tongue, or a fresh piece of beef. When cold, chop very tine two pounds of the lean; chop as fine as possible, two pounds of the inside of beef's suet, and mix the meat and the suet together, adding a teaspoonful of salt. Take four pounds of pippin apples, pared, cored and chopped fine, two pounds of raisins stoned and chopped, and two pounds of currants, picked, washed and dried, and mix the fruit with the suet and meat. Add two pounds of powdered sugar, two grated nutmegs, half an ounce of powdered cinnamon, a quarter of an ounce of cloves, a quarter of an ounce of mace, and the grated peel and juice of two large oranges; and wet the whole with a quart of white wine, a quart of brandy, and a wineglass of rose-water, mixing them well together. Make a paste, allowing for each pie eight ounces of butter and twelve ounces of sifted flour. Lay a sheet of paste all over a soup plate; fill it with mince meat, laying slips of citron on the top, in the proportion of half a pound for the entire mixture. Roll out a sheet of paste for the lid of the pie; put it on, and crimp the edges with a knife ; prick holes in the lid, and bake half an hour in a brisk oven. Meat will keep good for pies, several months, if kept in a cool dry place, and prepared as follows. To a pound of meat chopped fine, and four ounces of suet, put an ounce of cinnamon, an ounce of mace, a quarter of an ounce of cloves, and two teaspoonfuls of salt, add, if liked, eight ounces of currants, eight of raisins, and four of citron. Add too, a tumbler of brandy or wine, three spoonfuls of molasses, and sugar enough to make it quite sweet. Put all in a stone pot, and cover it with a paper wet in brandy. In using it, take equal weights of meat and apples pared and chopped fine. If not seasoned enough, add to the taste. If the apples are not tart, put in lemon juice or cider. Thanksgiving is America's national chow-down feast, the one occasion each year when gluttony becomes a patriotic duty (in France, by contrast, there are three such days: Hier, Aujourd'hui and Demain). I have given myself a challenge today, with the topic of apple pie. A number of previous posts have discussed apple pie, so what is there left to say? But wait! We have had the famous (or infamous) Mock Apple made with crackers, Apple Pie with Whole Pippins (and orengado), Apple Pie with Potatoes, Onion Pye Made by Labouring Mens’ Wives (with apples), and Pork Apple Pie. What we have not had is simple, uncomplicated, apple-only pie. The most important apple pie in early America was undoubtedly made from dried apples. Apples grew as well in New England as they did in Old England, and in a mere orchard-establishing while, the country was awash with the fruit. Luckily the apple is easily dried – a great bonus at a time of limited preserving methods. Barrels of dried apples were a staple provision aboard the wagons on the great Westward treck, so that even a migrating family could regularly enjoy out of season apple-pies. The New American Gardener of 1828 explained the very simple method of drying the apples. Mrs. Rundell in A New System of Domestic Cookery (1824) gives the oven-drying method. Put them in a cool oven six or seven times, and flatten them by degrees, and gently, when soft enough to bear it. If the oven be too hot, they will waste; and at first it should be very cool. The biffin, the minshul crab, or any tart apples, are the sorts for drying. Wash the apples in two or three waters, and put them to soak in rather more water than will cover them, as they absorb a great deal. After soaking an hour or two, put them into a preserving kettle with the same water, and with the thin peel of one or two lemons, chopped fine. Boil tender; when they rise, press them down, but do not stir them. When tender, add sugar, and boil fifteen or twenty minutes longer. Dried apples, soaked over night, are made tasteless, and are mashed up by being stirred. When cooked, stir in a little melted butter, some cinnamon, and powdered cloves. It is important that the apples should be of a tart kind. Jennie June's American Cookery Book. 1870. The natural term of an apple-pie is but twelve hours. It reaches its highest state about one hour after it comes from the oven, and just before its natural heat has quite departed. But every hour afterward is a declension. And after it is one day old, it is thence-forward but the ghastly corpse of apple-pie. It is the turn of cranberry pie today, in our Thanksgiving series. The cranberry is of course a major crop in the USA, and like the pumpkin, was used to advantage by the Native American Indians who shared their knowledge with the hungry, struggling early settlers, thereby assuring its place at the heart of Thanksgiving. According to a gardeners’s manual of 1839, one cranberry plant requires two and a half square feet of land and will produce three and a half bushels of berries which will supply one hundred and forty pies. Even if modern horticultural methods have not increased the yield, that is an extraordinarily generous pie plant. Living as I do in the nether part of the world, where fresh cranberries are as common as hen’s teeth and almost as expensive as fresh caviar, I am thoroughly entitled to be curious about cranberry pie. Most recipes give a cup for cup amount of sugar to berries. This is a jam proportion, is it not? Is the filling of the finished pie/tart jammy (or it that jelly-y?) I know that one year I will make it over the big water in time for Thanksgiving, and perhaps one of you will make me the real deal. I look forward to it. I have chosen a recipe for you today from an Iowa newspaper, the Waterloo Courier, of Nov 24, 1880. There are various ways to make a cranberry pie; some make it open like a custard or pumpkin pie. This is good, but not so good as to cover like an apple pie. Do not stew the berries, as some do before baking, but slit each berry with a knife. This will preserve the freshness of the fruit, which is quite an important thing. A cupful of berries aud an equal quantity of white sugar will make a medium-sized pie. .Those who like a sweet pie should have more sugar, also more berries if desired. Bake as usual. A little flour sifted over the fruit gives it a thicker consistence. One thing should not be forgotten, add a small teacupful of water. Do you, Oh Fresh Cranberry Pie Makers, really slit each and every berry individually before en-pastrying them? A great labour of love, that. The cranberry is also, as I understand it, indispensible in the form of sauce for the turkey at Thanksgiving – no doubt an adaptation of the ancient indispensible currant sauce for various meats from the English tradition. I can buy it in a jar here in Oz, but it looks like breakfast jam. Maybe I will mortgage the house and buy some fresh berries to make it this year for our Christmas turkey. Please send me your best recipe for cranberry sauce from scratch. Pecan pie like great-great-grandmother used to make was the request of “Jay” who is intrigued as to how she did it without corn syrup. This relatively late commercialisation of the nut probably explains why there is no pecan pie recipe in the considerable resources of the Feeding America: Historic Cook Book Project . Until the 1880’s, the only source of the nut for the pie-cook was the wild tree or the occasional garden specimen. The first mention of pecan pie in the Oxford English Dictionary is quoted from Harper’s Bazaar in 1886 – “Pecan pie... The pecans must be very carefully hulled, and the meat thoroughly freed from any bark or husk … ”. There is apparently a recipe in a New Orleans cookbook of 1900 but I know not what it is. The first actual recipe I have turned up so far (until I can find the one in Harper’s Bazaar), is in an Ohio newspaper (The Piqua Daily Call) of May 3, 1915. Cook together one cupful of sweet milk, one cupful of sugar, three well-beaten eggs, one tablespoonful of flour and one cupful of finely chopped pecan meats. Line a pie tin with rich crust, fill with the mixture, and bake until done. Whip the whites of two eggs with two tablespoonfuls of sugar until stiff, spread over the top of the pie and brown slightly in the oven, sprinkling a few chopped nuts over the top. So, there you have it Jay – the early, pre-corn syrup pecan pie was custardy rather than caramelly. In Clemetine’s honour, and in honour of my many American cyber-friends, and because a couple of you have asked for stories on them, I am going to dedicate the week to Thanksgiving Pies. Clementine only lists four varieties, but I know there are more. ‘Jay’ has asked about pecan pie like his great great grandmother used to make – you will have to be patient until tomorrow, Jay! Today, because she got in first with her request, the story is at the request of Laura, and it is on pumpkin pie. First, the pumpkin itself. 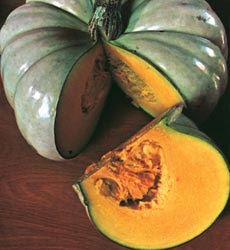 The pumpkin belongs to the family Cucurbitacae, which includes gourds, squashes, pumpkins, marrows, melons, and cucumbers. They are amongst the earliest cultivated plants in the world. The genus which includes the pumpkin and squash (Cucurbita) originated in the New World, and pumpkins were cultivated in Mexico (probably for the seeds) about 6,000 years ago. When the conquistadores arrived, they likened the big round fruit (the pumpkin, botanically speaking is a fruit) to melons (perhaps a general word for edible gourds, which were known in Europe.) Somewhere along the way for reasons that are unclear, these melons became pompones or pompion – and then pumpkin. In 1525 in the Grete Herball of Peter Trevis, there is a reference to ‘melons that we call pompous [pompons]' , so it appears that they were being grown in England by that time. Certainly, the pumpkin was a vital crop for the Indians of North America, who were generous with their plant knowledge to the early settlers. It is said that the pumpkin saved those early settlers from starvation on more than one occasion, which is perhaps why it is engraved so deeply on the national consciousness, particularly at Thanksgiving - particularly in the form of pie. Recipes are never invented of course, they are developed from a recipe ancestor. There is a Tart of Pompeons in the sixteenth century Italian text Epulario, and I have given the recipe for this in a previous post. Of course, the linguistic confusion between gourds, squash and pumpkins means that it is not always certain which is being referenced in early texts. The Tart of Pompeons is a strange (to us today) sort of dish – not quite custard, not quite cheesecake, and almost mincemeat pie. A similar concept of a starchy ‘vegetable’ (or fruit, in the case of the pumpkin) forming the base for a sweet dish has many incarnations, and I have previously given you a recipe for Carrot Pudding from 1715 which could easily be used for a pumpkin pie filling if the main ingredient were substituted. Just to show you that appreciation of the pumpkin pie is not confined to the USA, I give you a recipe from a Melbourne newspaper, The Argus, dated September 10, 1919. Here in Queensland we grow a fine, large, sweet, dry variety of pumpkin called the Queensland Blue, which is just right for the purpose - see the image above. Take a pint of well-cooked pumpkin from which as much moisture as possible has been pressed. Mix with it two well-beaten eggs, a cupful of sugar, a teaspoonful of cinnamon, a half-teaspoonful ginger, a little grated nutmeg, and the grated yellow rind of 1 small lemon. Line the piedish with shortcrust pastry, making the edges ornamental. Fill up with the pumpkin mixture and bake for half an hour or a little longer in a quick oven. Pumpkin pie should not be covered with pastry. I plead a little residual jet-lag today, so today’s story is short! I want to stray briefly back to the “Oriental” theme. I have been hoarding this recipe for some time. It is from Volume 5 of the Woman's Institute Library Of Cooking (undated, but around 1927). I like it because with the Christmas season coming up, it seems like a very versatile sweetmeat – it would be equally at home on a cheese platter, or with coffee. Maybe even dipped in chocolate? An excellent confection that can be prepared without cooking is known as oriental delight. It is composed of fruit, nuts, and coconut, which are held together with egg white and powdered sugar. Wash all the fruits, put them together, and steam for about 15 minutes. Then put these with the coconut and nuts through a food chopper or chop them all in a bowl with a chopping knife. When the whole is reduced to a pulpy mass, beat the egg white slightly, add sufficient sugar to make a very soft paste, and mix with the fruit mixure. If it is very sticky, continue to add powdered sugar and mix well until it is stiff enough to pack in a layer in a pan. Press down tight and when it is set mark in squares, remove from the pan, and serve as a confection. "Our trouble is that we drink too much tea. I see in this the slow revenge of the Orient, which has diverted the Yellow River down our throats. 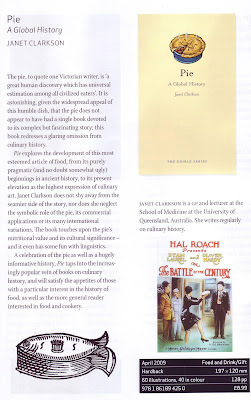 Earlier this year (in the week of May 12-16), we had fun with Dr William Kitchiner and his Magazine of Taste, as described in his book The Cook’s Oracle (1817). See the links below if you wish to revisit his ideas. Dr Kitchiner loved essences, spice mixes, and pre-made condiments of all sorts, which he used to jazz up a huge range of dishes. While acknowledging his particular passion, and the general Englishman’s love of proprietary sauces (Worcestershire, Harveys, HP etc), I had no idea that this concept of seasoning at the table was quite so – well, English - until I came across a little article in an issue of The New Monthly Magazine of 1833. The article disinguishes between seasoning in the kitchen (French) and seasoning at the table (English). There is a very general idea abroad, that the French are peculiarly artificial in their preparation of meats for the palate, and that the English taste is distinguished by its simplicity. In this, as in so many other things, we apprehend that the superficies alone is looked at. True, the Englishman prides himself on his joint, and pretends when he sits before his mountain of flesh, that he is approaching a state of nature. But with how many condiments is he not prepared to savour his viands? Has he not vinegars and sauces innumerable, mustard, pepper, salt, horseradish, and other flavourous pungencies, which, when joined to a gravy rich and hot, altogether make up a plat, worthy of any continental epicure! This is called plain living, simply because the cookery goes on in the dining-room instead of the kitchen. A Frenchman takes his dish as it pleases the chef de cuisine to send it, and he would as soon think of tampering with his coat as his meat, - both tailor and cook are artistes, and each considered equal to his business. In England a gentleman relies upon his servant, a mere subordinate, for nothing but precise roasting and boiling, and is himself in reality his own meat-preparer. England expects every man to be his own cook. All that is trusted to the kitchen is the application of heat. The composition of flavours is supposed not only an art above the Leonora of the realms below, but to require the test of each individual’s palate. Thus it would seem that a general system of cookery serves France while the individuality of this country demands that each man should interfere in the composition of his own dish. What is called seasoning is carried to an Oriental pitch at all English tables; while in France, whe are struck by the extreme insipidity of their most elaborate chef d’oeuvres. What is called French cookery in this country, is in fact truly English: it is the table composition manufactured over the kitchen stoves, and owns no originality in France, where they strive after a variety of flavours, but to the utter contempt of what an Alderman would esteem in the way of richness …. The respect felt for French cookery in England is the respect felt for regular art above empiricism … Though an individual epicure may succeed on his own plate, by means of a variety of condiments, in fabricating a delicious compound, he can neither offer it to another, nor give it a name: the French artist on the contrary, when he has studied forth a new variety of palatable flavours, can offer it to a whole table, and sanctions and canonizes the dish for ever by imposition of a title. Here are the elements of the apparent superiority of French cookery over English! I had better let Dr. Kitchiner have the last word; from The Cook’s Oracle (1817). Here is his advice on the roasting and seasoning of geese – in the kitchen. Geese are called Green until they are about four months old. The only difference between roasting these, and a full-grown Goose, consists in seasoning it with pepper and salt instead of sage and onion, and roasting it for forty or fifty minutes only. Obs. This is one of the least desirable of those insipid premature productions – which are esteemed dainties. Dr. Kitchener’s Magazine of Taste was featured in May 2008 - here, here, here, here, and here. There never was such a goose. Bob said he didn't believe there ever was such a goose cooked. Its tenderness and flavor, size and cheapness were the themes of universal admiration. Edged out by apple-sauce and mashed potatoes, it was a sufficient dinner for the whole family; indeed, as Mrs. Cratchit said with great delight (surveying one small atom of a bone upon the dish) they hadn't ate it all at last! Yet every one had had enough, and the youngest Cratchits in particular were steeped in sage and onion to the eyebrows. Yet More on The Orient. I just cannot put down Domestic economy, and cookery, for rich and poor, by A Lady (1827). Her “Oriental” recipes are Anglo-Oriental, but they are confidently so: she does not appear to be concerned about “authenticity”. What amazes me most, is that way back in the first few decades of the nineteenth century she was able to include a large cohort of “foreign” recipes in an English cookbook, and get away with it. Yet a century and a half later, as a child growing up in post-war England, I had never even heard of any of these dishes. They were certainly not in my mother’s Be-Ro cookbook. By the end of the nineteenth century, apart from the Anglo-Indian “curries”, this exotic influence seems to have disappeared. Where did those recipes go? I blame Queen Victoria. I remember a few years ago when couscous (the instant sort of course) suddenly became fashionable. Yet, here it is – made from scratch even – way back in an English cookbook of 1827. Mix some of the finest dry sifted flour in a mixture of yolk of egg, warm water, and butter; or water, cream, or milk, and granulate it with the points of the fingers amongst dry flour, till it takes a proper consistency. Prepare a fowl very nicely for boiling, boil the gizzard, slice it nicely, without detaching it, blanch the liver, put them into the wings, and lay the fowl into a saucepan that will just hold it, with a steamer fitted to it; season it with mace, white-pepper, and lemon zest; put in a little water or milk, and put the steamer over it, with the granulated flour or cuscussou; make it boil, and leave it in the embers to steam till it is thoroughly cooked; in the mean time prepare, according to the quantity, hard-boiled eggs, coloured with saffron; dish the fowl, pour the cuscussou over, and stick the eggs in at proper distances. Any other meat or fish may be so cooked, or with rice, instead of the cuscussou. In doing fish, which is excellent, it is necessary to put the cuscussou to simmer first over what the fish is to be dressed in, either seasoned stock or cream, and when ready, to put in the fish, which will cook in a short time. The hard eggs are equally good with the fish; dish in the same manner. I also remember the first time I had couscous at breakfast – what a novelty! - at a trendy Moroccan-ish restaurant in Sydney not too many years ago, yet here it is in 1827, albeit with a small English caveat. Sweet Cuscussou, as dressed at Morocco. fish, cheese, gourds, and apples, it being a dish of no expense, and particularly adapted, with fruit or vegetables, for children and invalids. The inhabitants of Morocco cover it with a great deal of spices, particularly cinnamon and sugar, and send it so dressed in presents to the women, but it is rather too high-spiced for English tastes. The author of our source from yesterday (Domestic economy, and cookery, for rich and poor, by A Lady) was quite prolific on the topic of “The Orient”. She includes dishes from India, Turkey, Persia, Syria, Egypt, The Levant, and Africa as well as recipes from the Tartars, Russians, and Cossacks. We have had several recipes from the book previously, but it still has lots of delights in store. There are in the book, nine different recipes for Curry Powder, and one for Cayenne Pepper. She also gives both Molukatanee (Mulligatawney) and Curry Soup, several recipes for Cubbubs (Kebabs), Indian Pillau and Cutcheree (Kedgeree), and the delighfully named Caldomuchocaldo (“hotveryhot”) which I promised to give you once before, and still have not done. I am not giving it today either, because I was waylaid and captivated by this idea of Curried Snow-balls. Curried Snow-balls, Lemons, and Oranges. Make curry farce* as above; acidulate it, according to the form it is to be made into, with a full quantity of lemon or orange-juice; make it into balls about the size and shape of a large egg or apple; fry them, and have ready rice cooked with top-pot and a little salt, and when the balls are cold, mould the rice nicely over them, and cover them with papers, that they may not take any colour, or colour the rice, or roll the balls in yolk of egg and a little saffron, and shape them as lemons, or add a little cochineal to the saffron, and shape them as oranges : they may sometimes be served up on parsley, or a clean curry sauce, such as molukatanee, or in a dish of rice, thickened vegetable curry sauce, or upon a napkin. This curry was like a performance of Beethoven's Ninth Symphony that I'd once heard … especially the last movement, with everything screaming and banging 'Joy.' It stunned, it made one fear great art. My father could say nothing after the meal. I (and my lovely daughter) are in Thailand this week. Shopping and Eating. It seems appropriate then, to give you something with an Eastern flavour. Take good cow's milk and put it into a pot; take parsley, sage, hyssop, savory, and other good herbs; chop them and stew them in the milk; take capons, and after half roasting them, cut them in pieces, and add to them pines [pine nuts], clarified honey, and salt; colour with saffron, and serve up. The author is referring to a dish (or one of a number of dishes) that are a fore-runner of our modern blancmange, or “white eat”, - one variety being called Blank Dessire or Blank de Sur, meaning “white dish from Syria”. For to make Blank de Sur. Take the zolyks of Eggs sodyn and temper it with the mylk of a kow and do thereto Comyn and Safron and flowr’ of ris or wasted bread myced and grynd in a morter and temper it up with the milk and make it boyle and do thereto wit of Egg corvyn smale and take fat chese and kerf ther’to wan the liquor is boyld and serve it forth. Form of Cury, circa 1390. A recipe for Blanc Maunger, also from the Form of Cury, is HERE. I prefer to regard a dessert as I would imagine the perfect woman: subtle, a little bittersweet, not blowsy and extrovert. Delicately made up, not highly rouged. Holding back, not exposing everything and, of course, with a flavor that lasts. Graham Kerr. With the party season almost upon us, I realise that the trifle (or tiramisu, or tipsy cake, or – as The Old Foodie Spouse calls it ‘wet cake and custard’) has been sadly neglected in this blog. Like Christmas fruitcake, trifle seems to be loved or hated (guess which category TOF Spouse is in), there is no 'Trifle is OK' brigade. A trifle (culinarily speaking) is, according to the OED “A light confection of sponge-cake or the like, esp. flavoured with wine or spirit, and served with custard and whipped cream”, although it used to mean simply “a dish of cream boiled with various ingredients”. The latter definition makes it closer to a modern-day fool, which is entirely cakeless – again according to the OED which defines it as “A dish composed of fruit stewed, crushed, and mixed with milk, cream, or custard”. To complicate matters, however, an earlier use of fool referred to a simpler dish of “a kind of clouted [clotted] cream” – which sometimes had sweet spices and eggs in it, which means it was a sort of fruitless custard. All of which means that the words trifle and fool have, in the past, been used in a random fashion. Overall, the OED would have us believe that a trifle can be a fool, but a fool cannot be a trifle, because no definition of fool includes cake. Take a quart of thick Sweet Cream, and set it boiling in a clear scoured Skillet with some large Mace, and whole Cinamon; having boiled it a little while, take the yolks of five or six Eggs beaten well, and put to it; being off the fire, take out the Cinamon and Mace; the Cream being pretty thick, slice a fine Manchet [i.e loaf of fine white bread] into thin slices as many as will cover the bottom of the Dish, and then pour on the Cream; trim the Dish with carved Sippets, and stick it with sliced Dates and scrape Sugar all over it. That most wonderful object of domestic art called trifle,..with its charming confusion of cream and cake and almonds and jam and jelly and wine and cinnamon and froth. O.W. Holmes. One of Hannah Wooley’s (1622?-1674?) contemporaries was our old friend Samuel Pepys (1633-1703). In the complete absence of any evidence, I like to think that Sam knew of her books – he was clearly a man who liked food, and he did have an impressive library of books and manuscripts. Sam’s diary has provided the inspiration for many posts in the past, and at least two of these have featured Neat’s Tongue (HERE and HERE). Neat’s tongue is Calf’s Tongue, and a popular dish all year round – but particularly useful at this time of the year as Christmas approaches. The great value of tongue was that it could be “dried” – actually salted (also confusingly called “pickled”) in the same way as ham. The advantage was of course that it could then keep well. Dried Neat’s Tongue really came into its own at Christmas when it was used in Plumb Porridge (or pottage) and Christmas Pie. The basic mixture of Plumb Porridge eventually thickened up and gave rise to Christmas Mincemeat (now mere Fruit Mince), Christmas Cake, and Christmas Pudding. Naturally, Mrs Woolley tells us how to prepare it. Neats-tongues, an excellent way how to dry them. Take Salt, beaten very fine, and salt-Peter, of each a like quantity, rub your Tongues very well with the Salts, and cover them all over with it; an as it wast[e]s, supply them with more, then roul them in Bran, and dry them before a soft fire; before you boil them, lay them in Pump-water one night, and boil them in Pump-water. Of course, if you wished, you could use fresh Neat’s Tongue for your Mince Pies. Take a fresh Neats-tongue, boil, blanch, and mince it, then mingle them together, and season them with an ounce of Cloves and Mace beaten, some Salt, half an Orange preserved, and a little Lemon-peel, shred with a quarter of a pound of Sugar, four pound of Currans, a little Verjuice and Rosewater and a quarter of a pint of Sack, stir all together, and fill your Pyes. P.S The Vintage Christmas Recipe Archive is HERE. William Shakespeare (1564–1616), Love’s Labor’s Lost. Salmon, as it used to be. Today I am off to Bangkok for a week with my lovely daughter, and I promise to have fun. I also promise you will get a story each day – pre-posted with the timer set for 5.30 am, Brisbane time. Hannah Wooley (our seventeenth century resource and inspiration for the week) had nothing to say about Thailand, or anywhere much East of England - apart from France, of which she was scathing. Hannah does have quite a lot to say on salmon however. Last year on this day I gave you a story about the first salmon to be caught in the Thames for almost a century and a half – thanks to a decade and a half of the Thames-cleaning program. Hannah would not have believed it possible that good English salmon would be in short supply - it was a staple on the seventeenth century table. She has several recipes for salmon, and to me they indicate one of the great myths of British cookery – that it has never been interesting, let alone excellent. I venture to say that if the following recipe appeared in a book by Nigella or Jamie it would be hailed as a fantastic and innovative way to serve the fish. When and Why did we lose recipes like this? Take a Rand or Sole, cut it into four pieces, and season it with a little Nutmeg and Salt, stick a few Cloves, and put it on a small Spit, put between it some Bay-leaves, and stick it with little sprigs of Rosemary, roast it and baste it with Butter, save the Gravy, and add to it for Sawce some Vinegar, sweet Butter, and some slices of Orange. There is but one season of the year when salmon should be served hot at a choice repast; that is in the spring and early summer, and even then it is too satisfying, nut sufficiently delicate. The man who gives salmon during the winter, I care not what sauce he serves with it, does an injury to himself and his guests. Today is Martinmas, the feast day of St. Martin – and in the northern hemisphere it is the official end of the harvest season. It was the day when the surplus stock that could not be over-wintered were slaughtered, and what could not be “put down” by salting and smoking and sausaging was eaten in a final pre-winter gorging session – the reason the day was also called “Split-Stomach Day”. In the background of course, the pickling and preserving of the fruit harvest had been going on for many weeks. This particular duty – along with preparing the household remedies and “cordial waters” - was the responsibility of the lady of the house, no matter how fine a lady she might be. Even if she did not take a hand in it herself, she was expected to be knowledgeable about it, and supervise it carefully because the health (and nutrition) of the household depended on it, especially over winter. 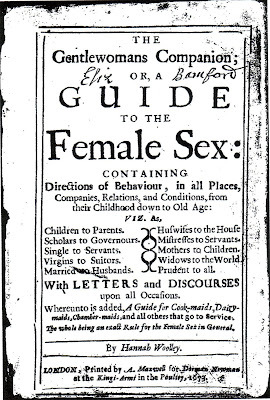 Mrs Wooley’s Gentlewoman’s Companion (1673) is our seasonal inspiration this week. She is adamant that Candying, Conserving, and Preserving “are Curiosities which are not only laudible, but requisite and necessary in young Ladies and Gentlewomen.” She is using “Curiosities” in its old sense of “Proficiencies.” Her instructions still hold good today – and I particularly like the idea of pears with ginger in wine. Take Pears that are found, and newly gather’d from the Tree, indifferent ripe, then lay in the bottom of an Earthen-pit some dried Vine-leaves, and so may a lay of Pears and leaves till you have filled the pot, laying between each lay some sliced Ginger, then pour in as much old Wine as the pot will hold, laying some heavy thing on the Pears that they may not swim. Take half a score of Green Pippins, (from the tree if you can), pare them, and boil them in a pottle of water, till they are like a Pulpe; strain them from the Cores, then take two pound of Sugar, and mingle it with the liquor or pulp so strained, then set it on the fire, and as soon as it boileth, put in your Pippins you intend to preserve, so let them boil leisurely; till they be enough; when they are preserved, they will be green; in like sort you may preserve Quinces, Plumbs, Peaches and Apricocks, if you take them green. And the cherry-and quince-"preserves" she made! With cinnamon in 'em, and all things rare! Out to old Aunt Mary's! Ah! Three hundred and thirty-six years ago to this very day, the author of The Gentlewoman’s Companion signed the Epistle Dedicatory, and presumably then sent it off to the publisher with great relief and the expectation of good sales. The publishing style of the times was that the title page was the book’s blurb and table of contents rolled into one, with a riot of fonts, bolds, italics and text sizes. The very useful book has chapters on such things as “Rules to be observed in walking with persons of honour, and how you ought to behave your self in congratulating and condoling them”, “Of Habit, and the neatness and propriety therof: of Fashions and their ridiculous apish Imitation” and “Of marriage, and the duty of a Wife to her Husband.” It also contains household remedies for everyday problems including “Against a Stinking Breath”, “Kibed Heels”, and “For one burned with Gunpowder”, and much wisdom on “Lying In” – that most hazardous time for every married woman. Amongst all of that Mrs Wooley had to make many pages available for cookery advice. Much of it is practical, essential stuff for the kitchen of the day – making preserves, pies, sauces, and basic roasts, boils, and stews. She did have some fancy stuff too – “jellies of several colours”, pickled flowers, and this delightful way of serving thick clotted or “clouted” cream so that it looked like a cabbage. Set over the fire six quarts of new Milk, and when it boils, pour it out into half a score of Earthen-pans or bowls, as fast as you can without frothing, set them apart, and when they are a little cold gather the Cream that is on the top with your hand, rumpling it together, and lay it on a flat dish; when you have laid three or four layers one on the other, wet a feather in Rosewater and Musk, and stroke over it, then searce a little grated Nutmeg, and fine Sugar, then lay three or four lays more on, as before, thus doing till you have all the Milk together and boil it again; and when it boils, do with it as you did before; it will yield thus four or five times seegihg, with which you must do as before, that it may lie round and high like a Cabbedg. You will do well to let one of the first Bowls to stand till last, that the Cream may be thick and crumpled, and that use for the uppermost lay, and so scrape Sugar in it. This must be made overnight for Dinner, and in the morning for Supper. This week I am going to see what treasures I can find for you in Mrs. Wooley’s book. The Blurb on the Pie Book! It is really going to happen - the pie book is really going to happen. The proof is in Reaktion Books' catalogue. It is going to happen in April. Click on the image to read the blurb! Every good book has some good out-takes, and every follower of this blog likes a historic recipe, so here are the instructions for a nice Lark Pie for you, from that intriguing Frenchman, the Baron Brisse. Pluck, singe, and flatten the backs of two or three dozen larks, draw them, throw away the gizzards, and pound the trail [the intestines] in a mortar with scraped bacon and mixed herbs; fill the larks with this, and wrap each one in a slice of bacon. Line a plain mould with paste, fill it with the larks, sprinkle them with salt and pepper, spread a thick layer of butter over them, add two or three laurel leaves, and a pinch of mixed spice; cover with paste, and bake for two hours and a half. Turn out of the mould, and serve cold. Malt is the name given both to germinated grain, and to the sugar derived from it. The process of germinating (“sprouting”) grain converts the starch to a mixture of sugars, thus increasing the sweetness, and the process is then halted by drying in a special kiln. The malted grain then used to add flavour and sweetness to beer, whisky, milkshakes and baked goods. Whoever thought of the process was clever, for sure. A second clever process extracts and concentrates the sugar into a thick gloppy brown syrup quite suitable for eating directly from the jar - which is another excuse for buying a quantity. Not only is malt extract very delicious, it is also highly nutritious as it contains a lot of minerals, amino acids, folic acid, and B vitamins – a third reason for purchasing a jar. I can hardly wait to hie me off to the supermarket today. 2 tablespoons lard or melted butter. Dissolve yeast, sugar, and Blue Ribbon Malt Extract in lukewarm water. Add lard or butter and half the flour, beat until smooth. Add salt and balance of the flour, or enough to make dough that can be handled, knead well. Place in greased bowl, cover and set aside in a moderately warm place until light, about one and a half hours. Mould into loaves. Place in well-greased bread pans, filling them half full. Cover and let rise until double in bulk. Bake forty-five minutes to one hour at 400o F. If a richer loaf is desired, use milk in place of all or part of the water. Yesterday’s story about preserving juice for use in Punch all the year round made me think of the other end of the olden-day preserving routine. Nowadays we squeeze oranges for juice and throw away the cup of rind. Throwing away something (a) expensive and (b) tasty would have been unthinkeable in the eighteenth century. In spite of no refrigeration and no canning, it seems that almost everything was preserved in some way, and nothing was wasted. Meat (and fish) was salted or pickled or dried or smoked, or cooked in great thickly-coffined pies which – if not cracked or damp – would kept meat for frighteningly long periods of time. Vegetables were a bit of a problem – so the winter supply depended on growing enough of the sort with naturally long keeping qualities such as cabbages, potatoes and onions, and storing them well in dry rooms or cellars. Fruit such as apples and pears also have naturally good keeping qualities if they are handled and stored carefully – or they could be bottled in syrup or made into fruit pastes. Even eggs were kept by a variety of methods – which deserve a post of their own, perhaps very soon. The skins of oranges or other citrus used for juicing for punch was made into chips – the same as the candied peel that we put in Christmas cakes. Most of us wouldn’t bother to make this now – it is cheap to buy, and anyway we are time-poor. Here is how we would have done it in the eighteenth century – when there were no candy thermometers, and cooks had a variety of tricks to tell them when their syrup was ready. How to make Orange Chips. Take the fresh Skin of Seville Oranges, whose Juice has been used for Punch, and lay them in Salt and Water three Days; then boil them tender, shifting them as above, and take out all the Strings of the Insides; put them into an Earthen-pot, make a Syrup of common Lump-sugar, and boil it three Times a Week the first Fortnight; then let it stand a Month longer, and take the Skins out of the Syrup and wash them in clear Water, turn them into Chips, and according to Quantity, if three Pounds of Chips, two Pounds of Sugar, wet it with Water and boil it Candy-height; then put in your Chips and let them boil, dip a Slice into the Syrup and blow it through, if it flies like Snow, you must take them out and spread them on an Earthen-dish to cool, so keep them for Use. Professed cookery: containing boiling, roasting, pastry, preserving, pickling, potting, made-wines, gellies, and part of confectionaries. Ann Cook. 1760? A cheese may disappoint. It may be dull, it may be naive, it may be oversophisticated. Yet it remains cheese, milk's leap toward immortality. Clifton Fadiman. Today, I thought I would give you something a little different – the bill of fare for an Election Breakfast in an English County (probably Westmoreland), in April 1761. It was given at the house of a candidate – but I have no idea whether it was to give an optimistic start to the day, to drum up last minute support, to feed the election workers, or to celebrate a success. It was for a large number of people, obviously. 6 Collars of Beef, sliced. 244 Chickens to the Hams. 6 Dozen of Tongues, sliced. 8 Pound of Chocolate [this was drinking chocolate]. 20 Dozen Bottles of Strong Beer. It does seem like rather a lot of booze for breakfast, doesn’t it? I guess the media were not so attentive at that time. “Punch” was usually “Milk Punch” at this time (which makes it closer to breakfast food, I guess), and we have had an early eighteenth century recipe for Milk Punch in a previous post. The following one is a little more interesting, because it also has Seville Oranges in it – and being in large quantity and prepared ahead of time, perhaps it might make a good Christmas Party beverage? Pare fifteen Seville oranges very thin, infuse the parings twelve hours in ten quarts of brandy; ready boiled and cold, fifteen quarts of water, put to this seven pounds and a half of loaf sugar, mix the water and brandy together; add the juice of the orange [s? ]; and of twelve lemons, strain it, put to it one pint of new milk; barrel it, stop it close, let it stand a month or six weeks. It will keep for years, the older the better. The lady’s assistant for regulating and supplying her table, being a complete system of cookery, Mason, Charlotte. 1778. Only one pint of milk in thirty gallons of brandy and water – it is clearly token milk punch. In the Olden Days, before Germ Theory, it was known that keeping out the air allowed things to be preseved, although no-one knew why it worked. Here is an eighteenth century recipe for ensuring a good supply of juice for punch (ready for the next election, perhaps?). A Method to preserve the JUICE of SEVILE ORANGES or LEMONS all the Year for PUNCH, SAUCE, JULEPS, and other Purposes. When you have got what Quantity you think proper of good sound Oranges, or so forth, squeeze them into a Flannel or Jelly Bag, thro’ which the Juice must pass till it is clear; which done you must put it into a deep Glass Vessel, well covered, and let it stand till it hath by fermenting purg’d itself of all Superfluities; then take Sallad Oil enough to cover it over, and pour upon it in the same Manner as it is on Florence Wine; then put it in a cool Place where the Sun doth not shine, which will preserve it so that the Air can’t have any Effect on it; but the Grounds and Lees will sink to the Bottom, betwixt which and the Oil, the Liquor intended for Use, will stand, which you must draw out by a Tin Crane put into it gently, taking care not to disturb the Grounds, and yet to put it deep enough to avoid drawing off the Oil, which will still follow the Juice, and continually preserve it from Putrefaction. Note, You may likewise by the above Method preserve most Juices of Herbs, Flowers, &c.
Champagne and orange juice is a great drink. The orange improves the champagne. The champagne definitely improves the orange. Prince Philip, the Duke of Edinburgh. A tin (can) of roast veal over a hundred years old was opened in 1938 at the request of the International Tin Research and Development Council. The tin was one of the exhibits in the museum of the Royal United Service Institution in Whitehall, London and had been taken on an expedition to the Arctic in 1824 by Sir William Parry (then a lieutenant) and returned unused. I used to think that calling the preservation of food in glass bottles ‘canning’ rather than bottling was an example of very flexible use of the language, but in fact the first large scale preservation of food by heat was done in glass containers. The pioneer was a Frenchman called Nicholas Appert (1749-1841) who rose to Napoleon Bonaparte’s challenge to find ways of preserving food to supply armies on the move, and won his prize in 1810. From then on things moved pretty quickly. Although Appert was the pioneer of the heat-preserving process, it was another Frenchman (Pierre Durand) who succeeded in using tins, and an Englishman (Bryan Donkin) who began large-scale production in 1811. The method was a success long before the science was understood – and the time and temperature of heating was empirical in those early days, with either grossly overcooked food – or worse, seriously undercooked – the risk. Germ theory only began to be developed in the 1830’s and 1840’s, and it was not until Louis Pasteur’s work in the 1860’s that it was found that heating stopped the growth of the micro-organisms that were causing food spoilage. We now call that process pasteurisation, in his honour. Turn out a shape of beef of six pounds weight [they were large cans!]. To answer properly it should be a firm good shape with jelly round. It must be cut in rounds three inches thick – this will make three rounds. Lay them in a dish three inches deep, cover them with this mixture:- One ounce of pepper, one ounce of salt, half an ounce of nutmeg, a quarter of an ounce of allspice. Melt all the jelly, put the rounds back intact into their own tin, one over the other. To accomplish this you must press each round down separately with a piece of wood that just fits inside the tin. When it is all firmly pressed in, pour (by degrees to let it all soak in) all round the edge the melted jelly well seasoned. Let the shape stand to get cold. If it will not turn out easily, dip it in hot water. This day in 1904 was the birthday of the English writer Nancy Mitford. I admit to knowing next to nothing about Miss Mitford, save that she was vaguely aristocratic and wrote a lot about the vaguely aristocratic. I do have one longish quotation from her in my file however that says much about that particular species. She is speaking about Right Honourable Sir Gerald Hugh Tyrwhitt Wilson, 14th Baron, aka Lord Berners (1883-1950), during World War II. I think it improbable –that Lord Berners ever ate Spam himself. Spam, as I am sure you are aware if you were born BC (before computers), is a “manufactured meat product” perpetrated upon the world by “The Yanks” and sent over to England by the shipload during the war, to the undying gratitude of the Poms, who came to love it with a guilty passion. Flake ½ lb. pork sausagemeat (with the outside fat removed), then mix in ½ lb mashed potatoes and one cupful of crisp breadcrumbs. Season well with pepper and salt adding a pinch of sage if liked. Then bind with a thick sauce made from the meat juices taken from the can, and made up to one teacup measure with vegetable stock and 1 tablespoon of flour plus a little of the pork fat from the tin. Divide into nine or ten sections, shape into finger rolls, coat in more crumbs, and fry or bake till heated through and crisp coated, with a light greasing of pork fat for the frying pan or baking tin. I guess if you are going to use canned pork sausagemeat, you may as well call the dish Fillets of Pork, yes? I also guess that it was Spam that was intended, but the MOF could not appear to be recommending a particular brand. Dine we must and we may as well dine elegantly as well as wholesomely. Isabella Beeton.